Kustodiev is a Russian artist who, with all his appearance, always was qualitatively different from the rest. Indeed, looking at his self-portrait, it is immediately clear that a real Russian peasant appeared before the viewer. His whole appearance suggests that we are facing a real, typical Russian man, who not only used to see us as foreigners, but also ourselves. Pay attention, his whole posture says that he is the real owner of his land. Either he left to hunt, or simply decided to inspect his lands, and perhaps he was going to look for something, and apparently, he would definitely find. In his hands one can see a gun. But it is understandable, why is it so idle to go somewhere? The view is very important, and if you pay attention to his view, it is immediately clear that he is looking for something, perhaps looking out or has already found and does not want to lose sight of. In the background, the endless plain, with a small wooded area, where at a distance, even merges together. Self-portrait is very surprising, the image itself is very close to the viewer, and allows you to see all the details of interest, both in appearance and in facial expressions. 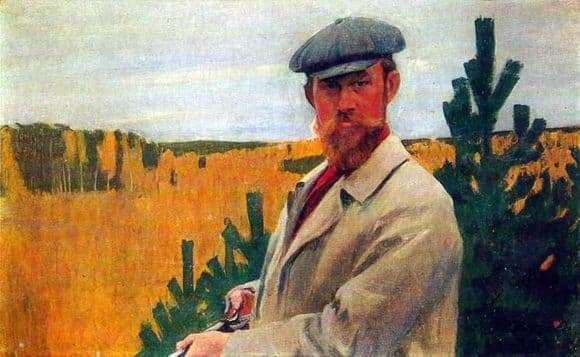 The self-portrait was most likely made in the autumn period, this is indicated by the Kustodiev’s clothes and the yellow trees that stand behind. In addition, it is often during this period that people go hunting, naturally proceeding from the beast they hunt. Finding why the artist decided to reproduce himself in this way is quite difficult, but then again, Kustodiyev was distinguished not only by his appearance, but also by the special vision of everything surrounding and happening, which in turn simply could not affect the painting. Serious and focused – this Kustodiev was familiar to a large number of people around him and admirers of his work. Self-portrait deserves the highest praise.